mommytherapy | From tantrums to milestones, this is my outlet for all things Mommy related! This is the flavor of anxiety we saw tonight in our 4 year old. We are going on a family vacation to Cape Cod in June. I brought it up at bedtime tonight to my daughter and said how excited I was. She lit up when I mentioned it but that light quickly faded. You could see the wheels start turning in her head. The wheels that you DON’T always want to turn for an innocent little girl. Her brows became furrowed. She started to stutter and ask questions. The panicked, anxious, racing thoughts went on and on with repeated questions even after our best efforts to acknowledge and reassure. It breaks my heart to hear such worries from a little girl that should be way more focused on her excitement for a vacation. I get that kids anticipate what things might be like in the future but the level she goes to is an upsetting one. And that is only the beginning of the challenges having an anxiety disorder has brought our Eleanor. It has been a really long road with many doctors, psychologists, evaluations and not to mention the struggle Ryan and I have had both collectively and individually. We’ve slowly started to get answers (there are sensory processing components as well) and see more clearly what makes her tick and as heartbreaking as it is to see your child struggle, these answers will hopefully also bring to light possible tools for coping and also open doors for finding the right supports. We’ve been lucky she qualified for services through CDS (Child Development Services) very early on and having that support was immeasurable (Teresa <3). That led us to her current school where I believe she is in the best place she could be. I think people hear the word “anxiety” or the term “anxiety disorder” and it’s largely misunderstood by those that have no true experience with it. Having anxious moments is a part of life. Feeling anxiety is a normal human feeling and response. An anxiety disorder though is a mental health disorder that is characterized by excessive feelings of worry, anxiety, or fear that interfere with someone’s every-day life. There are stretches in time where every single day is a complete struggle. Eleanor comes by it honestly; I was diagnosed with GAD (Generalized Anxiety Disorder) at 16 and it has completely affected my every-day life, sometimes in debilitating ways. I even have intense anxiety about writing and sharing a blog post like this. So Eleanor comes by it honestly, unfortunately. In kids it can present in many different ways. Tonight for example was showing in a very obvious fear or worry-based way. But often times it presents with extreme meltdowns and explosive tantrums because she struggles to understand or regulate big feelings she has inside and can’t quite verbalize what’s troubling her. There was a 2 year period where every single time we had to leave the house and put her in the car that it would take 20-30 minutes of screaming, biting, kicking, spitting, and hyperventilating to get her in the car. Two years!! Almost every transition from a bday party or family gathering ended the same as well. We began to dread going anywhere and felt alienated from other families that didn’t understand what it was like. We will have a conversation with another parent and we would mention that we were having a really hard time with Eleanor and tantrums. The common and understandable response is “oh yea, she’s 2 or 3! 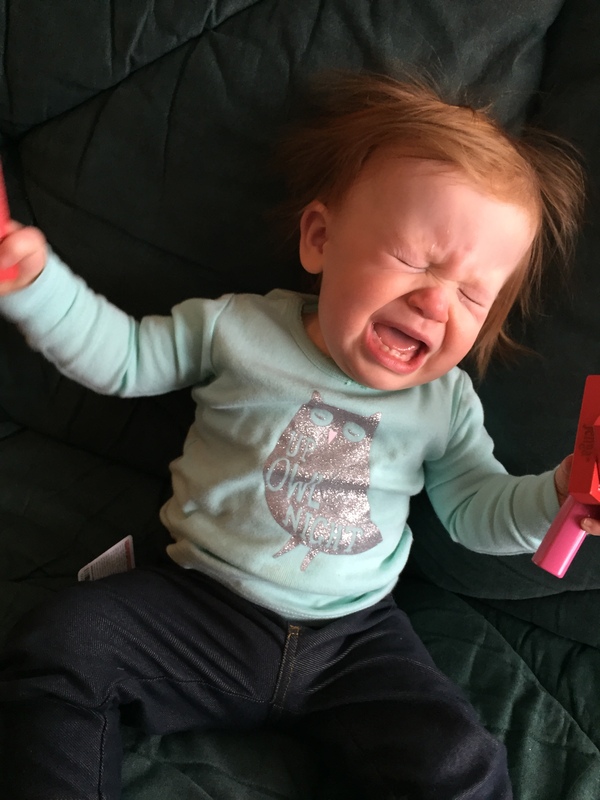 We have tantrums at our house.” But if we pushed a little we quickly realized Eleanor’s went to a very extreme level of upset and she had multiple huge meltdowns a day leaving us raw and numb. What gets us through is those moments of just seeing Eleanor. Without the anxiety. Without the dysregulation. Her personality is electric and she’ll either blow you away with how intellectual she is or have you in stitches with her shows and facial expressions. I’ve truly never met anyone like her and my goal is to help the truest Eleanor blossom while learning to cope with whatever challenges she might have or face. I could write a 10 page post about all the intense, grueling details of the last four years with Eleanor but I’d rather not broadcast everything to the world. In summary, it has been the hardest four years of my life and taken a toll that has forever changed both myself and Ryan. We still don’t feel like we have all the answers and other diagnoses could be in her future. But what I do know is that we are truly grateful for the family support that we have, the psychologist that has let us cry and vent for years, the support from CDS, the school that has helped her grow in leaps and bounds and as self-centered as it may sound, for the fact that she has parents that care and have tirelessly worked to do whatever it takes to help her cope and also blossom into the beautiful person she is. Calling all Moms of older kids – please tell me when and how your kids came out of the picky eating phase??? Or just tell me that they did?? I’m in desperate need of some perspective and hope here. I find this one of the more frustrating parts of this stage/age (3.5yo). Eleanor absolutely refuses to try anything new and has for well over a year and a half now. I know, I know – totally normal. I guess I’m not very laid back because it drives me bonkers sometimes. I hear all the time from other parents that their kids did the same and they survived and I do get that. I’m not so much obsessing about her nutrition or the variety of foods as I am just annoyed that I can’t offer her new things. She lives on chicken nuggets, noodles, PB&J and any snack that’s in a flashy package with a character slapped on it. (We ARE thrilled that she’ll eat the occasional banana and avocado though!) Her food allergies have not helped the situation at all. It has seriously limited our options. Luckily she has outgrown her egg allergy and we are optimistic she will pass her milk challenge in the next couple months. Then we’d just be dealing with tree nuts. It’s more that I want her to once in a while entertain the idea of trying something new that we offer. I put a new food in front of her and she instantly closes her eyes, covers her mouth and whines – or if we’re real lucky, flails and cries. One of the hard parts is that Ryan gets home at 7pm and we eat dinner after she goes to bed so she hardly sits down and has a meal with us as a family. I feel like that would be the perfect time to offer her small, new foods that we are eating without making her a whole meal that’s wasted. I’m just curious from you other Moms and Dads when you felt like things shifted in the picky eating department. Or were there any tricks that you found helpful? Or just say HEY – I’m with you Linz 😉 Happy parenting! I’m a bit of a mommy-zombie today. Eleanor had a weird night of waking and crying almost every 2-3 hours (brought up some good ol’ memories of the first 8ish months of her life!). No idea why! She couldn’t tell us anything, didn’t have a fever, and answered NO to every question we asked about any aches, pains or needs. It never goes well once we go into her room in the middle of the night, especially during night terrors but I don’t think this was a night terror kind of night. She had a very stimulating, busy day so that’s sort of my guess as we expect she has a form of a sensory-processing disorder (that’s a whole other topic!). She usually wants to get up and walk around the house, watch TV or even play. And when we say no we are going to stay in her room it turns into flailing, kicking, screeching tantrum time. Eleanor has never been a big cuddler or affection giver. (She has recently been giving family hugs and kisses, which melts my heart into a complete puddle.) But last night when I picked her up and sat in the rocking chair something amazing happened. She laid into me, stopped crying, and we ROCKED! I couldn’t believe it. Talk about Mommy Therapy 😉 She cuddled into me, you could tell she wanted me close and remained still. I wanted to just bawl my eyes out with happy, mushy tears. I think we rocked like this for 45 minutes, she even fell asleep. My back started revolting from holding her in the position she wanted to be in but I didn’t care. It was heaven on earth, a feeling that is pretty much impossible to describe, especially to someone that isn’t a parent. Time stopped and every single worry, thought, ache or pain just melted completely away. All we needed in that moment was each other and it felt like the calmest, happiest, therapeutic moment I’ve had with her in a really long time. Parenting is difficult as we all know and if only all of us could have these moments once a day to fuel us through the sometimes never-ending tantrums and challenges. I know this is a random sharing post but I hope all you Moms and Dads get to have a moment like this today, tomorrow, or when you really need it to recharge your parenting batteries. Not the 9 months we’d been hoping for. I have written this blog post 3 different times and deleted all of them. It’s a scary and personal thing to talk about. Why bother? Because if it helps one person not feel so alone or one person gain a better understanding, than I will be so glad I wrote this. Here it goes. I’m talking about infertility and miscarriages. The statistics are scary. According to the March of Dimes “as many as 50% of all pregnancies end in miscarriage — most often before a woman misses a menstrual period or even knows she is pregnant. About 15% of recognized pregnancies will end in a miscarriage. More than 80% of miscarriages occur within the first three months of pregnancy. ”On top of that, out of 100 relatively healthy and fertile couples trying to conceive, 20 will conceive in one month, 70 will conceive within 6 months, and 85 will conceive within one year. A year!! These are the sort of things swimming around in my head these last few months, as we have been trying for baby #2 for 9 months now and just had a miscarriage in October. And then October – another pee stick that I was ready to throw out. I glanced at it on the way to the trash and I saw the faintest line. I just started shaking and crying. It felt like this was it! We finally were pregnant! The next day and the next test the line was even darker, so encouraging. We were going to do the standard wait-and-tell a few weeks into the pregnancy. And then I had blood drawn. They called and wanted me to come in two days later to make sure my numbers were going up. They didn’t go up, they stayed the same. A week after that glorious positive test, the nurse told me it’s most likely an impending miscarriage. We were heartbroken. Even though it was only a week or so we had known, that was a week of building excitement, planning in my mind, experiencing this amazing relief after trying for so long etc etc. I couldn’t bear the thought of trying again for another 8 months maybe. And of course my family found out about the miscarriage. We really needed their support. The miscarriage itself wasn’t all that bad physically speaking but hormonally and emotionally speaking it wreaked havoc. I went into a really deep depression for weeks afterwards. I never really thought about it being caused by my miscarriage but it made perfect sense when I did some reading online. Miscarriages can have similar effects to post-partum depression, even earlier miscarriages. Your body ramps up the pregnancy hormones and then once the miscarriage starts they rapidly drop off – not fun. I had so many physical symptoms a couple weeks after my miscarriage then I did during the actual miscarriage. It affected my vision, I had pelvic pain, panic attacks multiple times a day, crying at the slightest things, and really just felt so disconnected from absolutely everything around me. But despite how difficult going through a miscarriage was, we are trying to focus on one positive fact – we did get pregnant, things are still in working order. And mentally how am !? I have really had to just let go of this “plan” I had in my head. A lot of this whole process is completely out of my control and I have to have faith that it will happen. As much as I wanted my kids to be a certain age distance apart, I now am at peace with whenever it happens, it will be great. The craziest thing I’ve learned about ALL of this is how common miscarriages and struggles with infertility are and how no one talks about it. It is so wrong that there is a stigma around it. Once we got tired of hearing “Where’s baby #2?” we started sharing a bit of our struggle when people asked and it’s amazing how many people eagerly then shared their experiences. So many people we know have had miscarriages or took a long time or needed interventions in order to get pregnant. It has made me question a lot of how the whole thing is typically “handled.” Try try try, conceive, keep it a secret, have a miscarriage, devastation, don’t reach out because no one knew you were pregnant in the first place. Something like that. So many women are going through this alone and they don’t know that alone is the last thing they should feel with so many women going through the same exact thing. They feel like maybe something is wrong with them or their partner and suffer in silence. When people I know told me their stories, it felt so comforting to know I’m not the only one and that there can be a light at the end of this tunnel when I hear they go on to have successful pregnancies. We are a much more open and sharing society today than we were 50 years ago and I hope that the stigma around infertility and miscarriages goes away as women are able to see that reaching out or seeking support in these times is not a scary or shameful thing and that you’re not a failure. I’ve also gained such perspective on other things through all of this. Like a greater gratitude and blessed realization for what I have in Eleanor. She is the absolute greatest thing in my life and I can’t even express the love I have for this little ball of energy. Let me finish with recognizing that many couples (and a few that w know) have been trying for much longer than we have and our hearts really go out to them. We send love to anyone going through this, at any level, and feel free to reach out to us anytime. Baby dust to all those who need it! Ugh….even poor Ruby was feeling the affects of the phone-attached-humans! We have become a little disconnected lately. Not too surprising with a rambunctious toddler in our midst, both of us trying to work, house projects, the list goes on and we all have one. I tried to think about things we could do to reconnect. The typical “one date night a week” idea has just never stuck so that idea was out. Then it hit me that one of our biggest problems is how much time we zone out on our phones. For me it’s Facebook and googling the heck out of everything and for Ryan it’s forums, researching hobbies, and Instagram. So with a little convincing we both decided to disconnect from those things for a week. No Instagram, Facebook, Google or anything involving the internet for that matter. The only exceptions were work-related things and responding to any messages someone might send us. Day 1: Holy moly. I had NO idea how many times a day I instinctively picked up my phone and checked my FB news feed. I had to catch myself probably 25 times today. I had to be so conscious and stop myself from reaching for my phone periodically. It sort a felt like a craving that I was trying not to give in to. So weird. Going on my phone is the last AND the first thing I do everyday. But I did NOT go on FB once the entire day. We went to bed tonight and I started a book! Ryan read some of the magazines in his growing pile. Day 2: Ryan cheated today. The rule was if anyone messages you on social media you can respond so that we aren’t being rude but NO browsing on either Instagram of FB. Ryan’s biggest issue was the internet and Instagram so when he was tagged in a photo on Instagram he went to view it and the temptation was too great; he “started to swipe” he guiltily admitted. I have maybe gone onto a website or two to research something briefly but I’m pretty impressed I have NOT gone on Facebook once. Day 3: It was interesting tonight when Ryan got home. He was playing with Eleanor and being so attentive. Then when she sort of wandered to the other side of the room and started to entertain herself, I watched him squirm for a second because that is when his phone would have normally appeared. But he resisted. Eleanor came back over to him and they continued playing. I just thought to myself “this is what it’s all about, this is why we’re doing this.” Not only for ourselves of course but for our family, for Eleanor. We don’t ever intend to delete any accounts or disconnect completely. Facebook to me is too valuable when it comes to staying in touch with family and close friends or being able to see big moments in their lives and watch their families grow. But we do intend to extremely limit our “Plugged-in” time and focus more on us. Final day: I was actually not looking forward to ending this week. Looking back at the week I felt more relaxed, less scatter-brained and more connected with Ryan. With social media there is this pressure to keep up with your feeds so you don’t miss anything but in doing so you are missing out on so much real life right in front of you. One of the first blogs I read when I was reunited with the internet was interestingly enough about a similar topic but in relation to mothering. (I sadly have not been able to find that blog post again to give them credit!) The basic gist of the post was about how mothers today are so self-conscious and questioning every little parenting move they make because of the overwhelming ease of researching as well as the epidemic of comparing and judging. The funny thing is mothers have never been so connected and so well-rounded yet they don’t even know it or they question it based on making comparisons with so many other moms. Think about being a mother before Google and parenting books. You simply asked your mom for advice and maybe friends and family if you wanted to pick up the phone and call them with each question. The internet is saturated with “do this” “don’t do that” “you shouldn’t cosleep” “cosleeping is wonderful” yadda yadda yadda. Anyway, what I basically took from this blog as well as this last week is that I’m doing the best I can and I’m a damn good mom. I will listen to others advice but I will only take it if it will truly be best for me and my family. I will also limit screen time with any media and connect more with my family without any screens. I highly recommend it. Update 8/13/15: Well it has certainly helped that the second I take out my phone Eleanor MUST have it. I literally can not even have my phone anywhere nearby without it inciting a full-blown tantrum if she can’t play with it. It stays hidden on the counter while we spend time with Eleanor. So I have really kept my reduced phone use promise to myself. Ryan on the other hand…might need a little more convincing, maybe in the form of another unplugged week?!? *THIS* is what it’s all about. Biting, Hitting and Scratching….Oh My! It has started. Maybe a little sooner than I naively expected but how would I really know what to expect with my first child? I’ve emphasized how spirited and feisty my little Eleanor is and that personality is stronger than ever. And so, the biting, hitting, scratching, body-flailing temper tantrums have begun. I guess the hardest thing we had to learn, and learn QUICKLY, was patience. By 3pm and tantrum number 9 for the day, patience seems unobtainable. When she first started expressing frustrations and anger through tantrums I would simply become frustrated and angry with her. Why did taking that tiny penny away from her upset her soooooo much? Why is she throwing herself around in a fit of emotion, she is going to hurt herself! But I’ve learned through some mommy peers and experience that I simply must stay calm and be patient. The more calm I am, the quicker the tantrum passes. Are they still frustrating? Yes. Am I still utterly exhausted at the end of the day? Yes. But I want to be sure that I do whatever I can to help her through it safely and while calmly modeling behavior I hope she’ll exhibit someday as she matures. And this is SOO much easier said than done, especially when she hauls off and whacks me right across the face with what seems to be devilish grin OR contorted face of anger. So many people say “woah, you’re in for it” and “she’s a handful that one!” And while I know that some of it comes from her extremely strong willed, passionate personality, I also do realize that this is a completely normal stage/phase/behavior for her age. When you really sit back and think about it, it must be incredibly frustrating to be in her shoes. With no way to fully communicate what she needs or wants, I sometimes don’t blame a little flare in her temper. She is running around, comprehending so much and wanting to explore and share so much with us – all of that with no ability to verbalize or understand how to emote accordingly. I think one of the biggest things we can learn as parents that will help us better understand our kids is that we can’t expect them to have the same faculties, mental processes, or emotional maturity that adults have. It’s so hard to see it that way because it’s almost like trying to imagine unlearning all that we have acquired our entire lives to exist the way a toddler does and step inside their brains. But it’s simple, they can’t comprehend everything we can, they don’t have the same emotional control we have, and they are easily overstimulated because they are taking in and learning so much more every hour than we are in an entire day or week even. Thought I’d share a happy, joyful moment too! I pose a question to veteran Mom’s out there: what did you do when your toddlers were a bit young for discussing their feelings/actions and they completely melted down? I’m talking head-butting or going-completely-limp-then-flailing uncontrollably-and-screaming kind of melt downs. We feel like we’re on the right track as far as modeling our behavior for her but any and all advice would be very welcome!